Our Bath & Brush Out package includes a special Hydrosurge bath with one of our great aromatherapy shampoos, blow dry with complete brush out, nail trim and ear cleaning. Your dog will come out looking and smelling like a million bucks. We will recommend the ideal shampoo for your dog based on their skin and coat condition. Leaves your dog’s coat soft and shiny. Great for all types of fur! Frequent nail trims are important for your dog (and your furniture and floors too!). 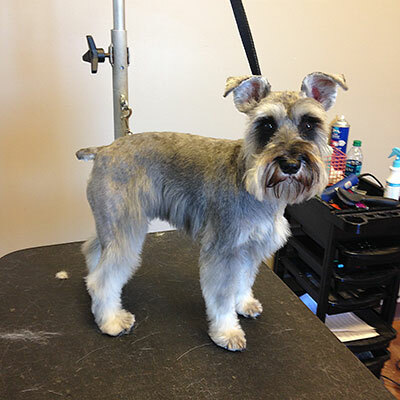 We are always happy to look at your dog’s nails to help you determine how often they need to be trimmed. Sometimes a simple nail trim is great but after trimming your dog’s nails they will be a little sharp. Grinding rounds them out and makes them shorter than clipping alone. Grinding is especially nice for jumpers and cuddlers! Dental care is extremely important to your dog’s health. Let us help you to maintain your dog’s oral health. Treat your pooch to a relaxing blueberry facial. Gentle cleaning and brightens up your dog’s face. $6 for a facial or $10 for an all over application. If your dog is a little on the sensitive side we can use a special hypoallergenic shampoo and conditioner to keep your dog clean and free of artificial dyes and perfumes. If needed we can use your vet supplied shampoo. You may email us at info@petcp.com and we will get back to you within 24 hours! Please fill out our grooming contract prior to your first appointment. If you need immediate assistance call us at 312.397.9077. Correction Cuts: If you are not satisfied with your dog’s haircut, you have 5-7 days to come in for a correction free of charge. Any appointments booked after this time will be charged full price. No Show Policy: In the event of cancellations received less than 24 hours prior to your appointment or “no shows”, we reserve the right to add a service fee in the amount of 50% the rate of your groom price.